Is Eco-Conscious Fur An Oxymoron? When you were trying to figure out what to buy for the environmentalist on your holiday list, fur probably didn't cross your mind. Some ecologists and fashion enthusiasts are trying to rekindle a market for fur made from nutria -- rodents that are destroying Louisiana's marshes. It's being promoted as guilt-free fur. Is Eco-Conscious Fur An Oxymoron? When you were trying to figure out what to buy for the environmentalist on your holiday list, fur probably didn't cross your mind. But some ecologists and fashion enthusiasts are trying to rekindle a market for fur made from nutria -- rodents that are destroying Louisiana's wetlands. Unusual fashion shows in New Orleans and Brooklyn have showcased nutria fur made into everything from g-strings to full-length coats. Even the cello player at a recent show in Brooklyn, who accompanies the models as they strut down the runway, wears a nutria bikini. "It sounds crazy to talk about guilt-free fur -- unless you understand that the nutria are destroying hundreds of thousands of acres of wetlands every year," says Cree McCree, project director of Righteous Fur. That's a bit of an exaggeration. But nutria -- beaver-like rodents with bright orange buck teeth -- are so voracious in eating the roots of wetland plants that they destroy Louisiana's marshes and turn them into open water. That makes New Orleans more vulnerable to hurricanes and limits habitat for Gulf of Mexico seafood. State scientists were so concerned that they put a bounty on nutria. They pay trappers and hunters $5 a tail. Some of those pelts end up in the fashion shows like one in Brooklyn last month. Invasive species scientist Michael Massimi attended the event. He says he never imagined he'd end up frequenting fashion shows. He even modeled a nutria outfit for a photo shoot. "This is a type of field work that I didn't envision," Massimi deadpans. His ecological organization, the Barataria-Terrebonne National Estuary Program, is the unlikely sponsor of Righteous Fur. Massimi says he has no qualms about promoting the fur because these critters don't belong in Louisiana's marshes. They were brought there from Argentina by fur farmers and let go into the wild. The fur trade kept nutria in check for decades, but when the market for nutria collapsed in the late 1980s, the cat-sized animals multiplied like crazy. Biologist Edmond Mouton runs the nutria control program for Louisiana. He says it's not easy to convince people that nutria fur is green. But he has no doubt about it, after seeing firsthand how nutrias ravage wetlands. "The nutria start to dig down to get the roots and the more tender parts of the plants, and once those plants start to die, those floating marshes tend to break up and turn into open water," Mouton says. "A lot of that marsh will be lost forever." Over the past eight years, 20,000 acres of wetlands converted into open water after nutria ate the plants, he says. That's a loss of an area about the size of Manhattan. His program is funded by federal taxpayers, and it's making headway. In the eight years since it started, the acres harmed annually by the rodents fell from 100,000 to 8,000. 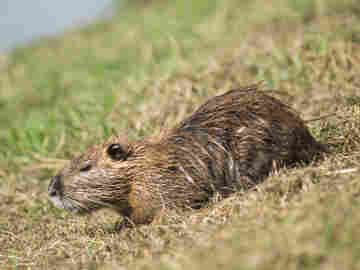 "We've had about a 90-percent reduction in damage from nutria. It's very impressive. Much to our surprise, it worked very well," Mouton says. Trappers and hunters bring in more than 300,000 nutria tails a year, so part of Mouton's job these days is trying to promote fur. He says sales to China are up. And some American designers -- including Oscar de la Renta -- are including nutria in their collections. And then there's Righteous Fur and its offbeat fashions. For example, the plunging back of model Paige Morgan's dress is trimmed with nutria tails. She says she loves the fur and thinks many other people will, too. "To give them a guilt-free option that they can wear without someone throwing paint on them -- I think that's going to be a massive thing, at least here in New York," Morgan says. Some animal lovers dispute the idea that any fur could be eco-friendly. They argue that traps used to catch nutria aren't humane, and neither is shooting them. Designer Jennifer Anderson admits it took her a while to come around to the opinion that using nutria pelts for her creations is ethical -- and some of her friends tried to talk her out of it. "They just said, 'Bringing fur back into fashion is only going to cause a ripple effect that it's OK to wear fur,' " Anderson says. That got Anderson thinking about a basic problem with wearing nutria: How will other people know that it's eco-friendly? She's trying to come up with a label to attach to nutria fashions to show it's "virtuous" fur -- and not that other kind.